Rumours around the possibility of a 'Performante' version of the Lamborghini Aventador have been fueled with these new spy shots of a slightly revealing rest mule of the brand's flagship supercar! Seen from the front, this Aventador looks quite identical to the standard model but, when you see the back, things get more interesting. The prototype shown in these pictures shows an exhaust disguise that bears a strong resemblance to early prototypes of the Huracan Performante. 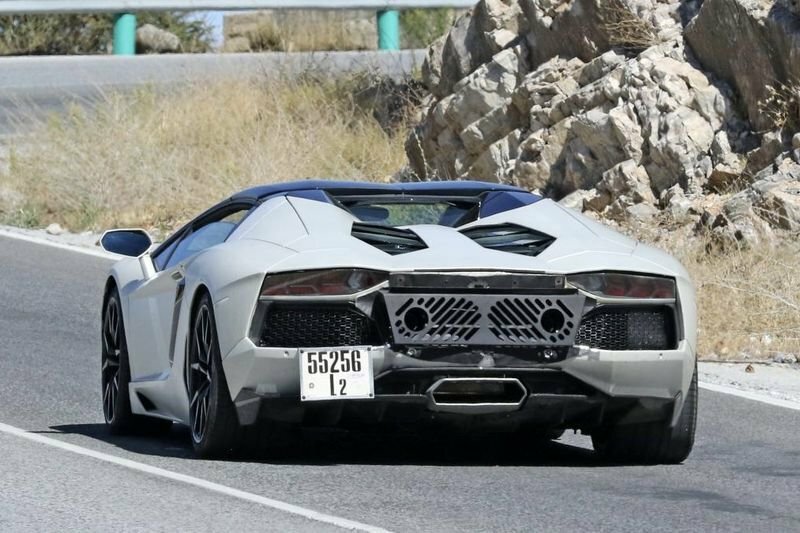 The bulked-up track version of the Aventador's smaller sibling came with a big spoiler and twin exhausts emerging from between the tail-lamps. In addition, it still features the standard rectangular exhaust that first debuted on the Murcielago in 2001, which is most likely to be a fake to throw us off. It is still unclear as to whether the Aventador Performante will actually come to light. After all, the LP750-4 SuperVeloce has served well as the juiced up alternative to the standard Aventador, with 50bhp extra from the 6.5-litre V12 engine and 50kg shaved off the weight. Alongside the coupe prototype, the white Aventador seems to be a Spyder edition, with a black carbon roof that can be removed and thrown in the boot. We will have to hold out for full details but it looks likely we'll get an Aventador Performante next year! Video: Stretched Lamborghini Aventador Limo Concept Unveiled!